but unlike the terrifying fox it is quite humorous in its tricks. "tanuki" can also be read "ta-nuki,"
or pulling away from the crowd, a symbol of victory.
. Dadaboo 八町のだだ坊 Hatcho no Dadabo Tanuki .
. Danzaburo 団三郎 from Sado Island .
. Inoshishi 猪 and Tanuki legends .
. nakōdo 仲人 Nakodo, legends about Tanuki matchmakers for marriage . About 60 years ago, there lived an old Tanuki. He was venerated in a small shrine. But the shrine went into decay and the Tanuki came out again to play his tricks on the farmers. Once a woman gave birth and the Tanuki happened to see her bottom and then bewitched her. She became quite weak and all prayed for her and begun to recite the 心経を千巻 1000 sutras. When they had come to about 30 sutras, the Tanuki promised: "When you have finished the 1000, I will not come out any more." It took them three days to recite all the 1000 sutras. So the Tanuki said: "Well, I will now go back home, but please keep worshipping me!" And what do you know, the woman recovered in no time, after worshipping the Tanuki.
. a Tanuki named 八兵衛狸 Hachibei at temple 建仁寺 Kennin-Ji . There are other Tanuki named Hachibei in Japan.
. . . CLICK here for 八兵衛狸 Photos !
. Ohaguro ba おはぐろ婆 Old Hag with Black Teeth .
. The 岡部吉左衛門 Okabe Kichizaemon family . Once during a 台風 typhoon the temple hall broke down and the Buddha statue was swept away by the floods. So the villagers strengthened the ground with concrete before re-building the hall, but suddenly four accidents happened, one after the other. One priest told the villagers that a Tanuki was buried under the concrete and he could not breathe any more. So they made a hole in the ground and the accidents stopped.
. haifuri tanuki 灰降狸 the ash-throwing Tanuki .
. Minato ward Tanuki legends 港区 .
. Mujina from Itabashi 板橋 . Not "fearful fox," though foxes can be timid, but terrifying fox as people could be frightened by it? Or, because it was not physically terrifying, better yet SPOOKY FOX because spooky means frightening because of being a bakemono, right? Also, be sure to note at top that tanuki has often been mistranslated as badger. And, of course, I hope all such will be put with the tanuki and only where the original was mujina w the badger tales! Tanuki have such delicate little feet, I hate even seeing the name badger near them! Thanks a lot, Robin ! I hope to find more time to dedicate to the Tanuki. They are a constant visitor to my garden! During times like rainy evenings, it would disguise as a person with an umbrella and invite people. When a person who doesn't have an umbrella goes under it, it is said that they'd be taken to unbelievably out-there place. on a rainy day an actor was walking along with his Bangasa. The umbrella suddenly felt very heavy and then very light. The man made a summersault, threw the umbrella on the road and fled in great haste. Next morning, what do you say ! there was a dead Tanuki badger on the road. They are known in 筑後久留米 Chikugo Kurume, 三井郡宮陣村 in the Mii distrct and other parts. A Tanuki climbs on a three at the dam of the upper Tonegawa, his body covered with sand. If a human passes by, it shakes its body and splashes sand on the person below it.
. tanuki 狸と伝説 racoon dog, badger legends . In the ruins of 鉢形 Hachibata castle in Chichibu there live many foxes and Tanuki. At night when there was a poetry meeting at the nearby temple, there was suddenly a strange laughter from below the brazier, just at the most scary time of the night. When they moved the brazier, a black monster animal jumped out and run toward the Buddha statue. When they looked at the statue the next morning, the statue begun to laugh. Then they tried to cut the statue into pieces, a black monster animal like a Tanuki run away fast. 釈迦来迎 Shaka Raigo, Shakyamuni coming down and died. The priest then made a grave for the Tanuki and put the lid of the tea kettle on top of it. 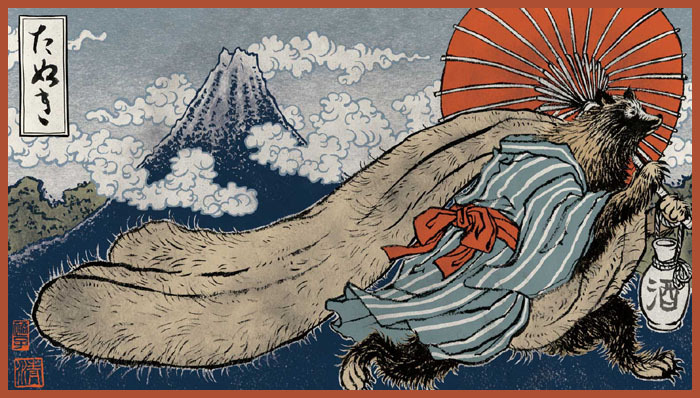 "The Japanese raccoon dog or tanuki, a shape-shifting, hedonistic and jovial trickster, has always lived in the borderlands between human settlement and the wilderness – liminal, shared spaces not quite of this world, and not quite of the other. Its complex folkloric history is also the story of the uneasy and unreconciled relationship in Japan between modernity and nature, progress and tradition."